Known as the "Nabi of the beautiful icons", the deeply religious Maurice Denis is celebrated alongside Vuillard and Bonnard as one of the most important Nabi painters, a founder of the movement and its brilliant theoretician, and unquestionably the most fervent promoter of the Nabis. Denis wrote numerous reviews, articles, and treatises, including the group's manifesto defending the innovations of Paul Gauguin that emphasized the importance of the decorative elements of line, color, and form over pure representation. A member of the Symbolist Movement, Denis constructed theories that contributed to the foundations of Cubism, Fauvism, and Abstract Art. Maurice Denis received a classical education in the Lycée Condorcet where he met Vuillard, Roussel and Lugné-Poë. While studying in the Lycée he took drawing lessons and copied paintings by the old masters. In 1888 he enrolled at the Adadémie Julian and then at the Ecole des Beaux-Arts. In the same year Paul Sérusier showed his friends at the Académie Julian the famous landscape that he had painted at the suggestion of Gauguin in Pont-Aven, which was considered a "talisman" of Gauguin's doctrine of Synthetism. This was a decisive revelation for Denis who found himself attracted by the new idea of Synthetism and by Gauguin's paintings, which he first saw at the exhibition of the Impressionist and Synthetist Group at the Café Volpini in 1889. Denis joined the Nabis (a Hebrew word meaning 'prophets') and in 1890, in the review Art et Critique, he published his famous article in which he stated the artistic credo of the group. During this period he became associated with the Symbolist writers, illustrating the books of André Gide and Paul Verlaine's Sagesse, and designing front-pieces for Maurice Maeterlinck's Pelléas et Mélisande and for musical scores of Claude Debussy. Like the other Nabis, Denis experimented in various fields of art, designing carpets, painting cartoons for stained-glass and mosaic panels, and decorating ceramics. The 1890s saw his first large-scale decorative works, the painting ceiling in the house of the French composer Chausson (1894). Audi Filia in Latin translates to 'Listen, Daughter.' It refers to John Avila’s most referred to and famous piece of literature. He was a Spanish priest, writer and major figure in the ecclesial reform that came to pass in 16th Century Spain. The first line of the writing reads “Listen O Daughter and see; incline your ear…." 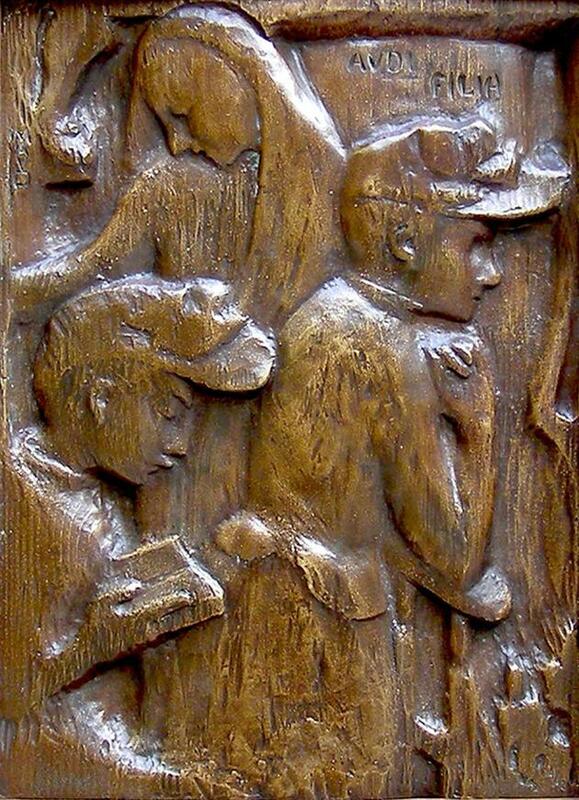 We believe this bronze to have been cast off a woodcut by the artist. The surface of the piece mimics a woodcut and Rudier has carefully patinated the piece to resemble a carved wood piece. Members of the Nabis Group and artists such as Gauguin did not produce great amounts of bronzes, even when they did produce the occasional piece of sculpture. These artists did execute some very interesting work in wood. Similar to Degas, Renoir and certain other impressionists, sculpture was more personal to these artists and done almost as if for themselves than for an art buying public. Gauguin carved in wood and the bronze works we see today are all posthumously cast off the wood pieces. The question remains why and how Georges Rudier came to cast this work. Very successful editions of Gauguin’s works were cast posthumously by Valsuani and Degas’ by Hebrard. 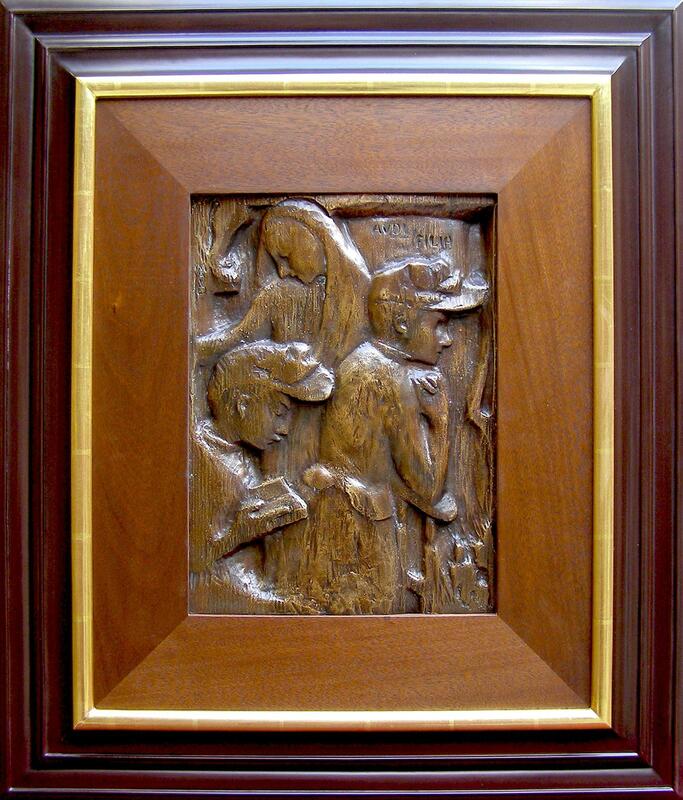 We believe that very few of Denis’ woodcuts have been cast in bronze. This is based primarily on the fact that none have surfaced through auction. Audi Filia would have potentially been an illustration for a book. Many of his works reflect religious processions and people engaged in devout activities. Denis achieved a level of mysticism in his work which reverberates and moves us in the same way Gauguin’s work of this nature still does. Gauguin took a very similar approach in his work as did Ranson and Serusier. It is a compelling work which conveys the spirit and aesthetic of this particular school of art that flourished in Pont-Aven.